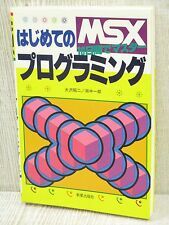 Home » Forum » MSX Talk » Software » Does anyone know what's this exactly? Does anyone know what's this exactly? I wondered what's this? To me it looks like a mix between a Japanese and European version. I don't remember having seen something like this before, so I believe it's some handmade copy, but I'm no specialist. Considering people are already bidding to 775€, I guess it's not a copy after all but a rare edition? Is there anyone around knowing more about this edition, I'm curious? It's the later EU version (see the clear plastic tray in the first picture). Oh wow thanks for the information. @Sylvester, I've looked at the topic, and those boxes are gorgeous. I had absolutely no ideas there were such editions. They are just beautiful. Incredible artwork. All of them. Yes, there are two different European releases. This one is smaller and indeed pretty rare. Thank you, well these small covers pictures were not on generation-msx when I checked before asking here (and it's confirmed by the google cache: they were not here 5 days ago). Actually the pics are from this very ebay auction, so it has to be pretty uncommon indeed! I'm not the seller and not a potential purchaser (those prices are crazy! ), but if I had won the lottery it would definitively be in my purchase list. Metal Gear was probably the game which had the biggest impact on me as a 7 yo kid. Big boss breaking the 4th wall and giving me the order to turn off my MSX in late game, it left me stunned and I still remember it today (and 14 years later in MGS2 I almost cried when the same happened, lol). Big boss breaking the 4th wall and giving me the order to turn off my MSX in late game, it left me stunned and I still remember it today (and 14 years later in MGS2 I almost cried when the same happened, lol). Yeah, that was a super cool reference. Even showing footage of the original game. I remember like it was yesterday when my dad turned on the MSX, said: "Try this, it's fun. And don't curse!" and left the room. Even the way the title came up already left me in awe. I was so impressed by the game that I actually drew cartoons about it and stuff. Haha, sorry for the rant, these are just fond memories. Yeah, a friend showed it to me. I was totally amazed enemies couldn't see you when standing in the shadow. The whole idea of sneaking instead of running around ikari warriors style. Excellent. And the graphics looked (and still do) awesome. Funny that the foxhound logo is on the back. That logo is nowhere to be found on the bigger european version. And another detail, the bigger european version was made and fabrique in japan but printed in the UK. The smaller boxes all are printed in japan, although they where for the european market. Indeed, those bids look pretty insane to me. I do wonder if anyone actually turned off their MSX when BB instructed to do so? I myself might have hesitated a bit what to do back then..
That actually makes sense: shipping (-costs). Pack the max. # of carts into those crates that make the long journey. For the smaller boxes: print in JP, pack complete in retail boxes, and those into a shipping crate from JP -> Eur. No point in doing the printing elsewhere. For bigger boxes: pack loose carts into a shipping crate from JP -> Eur (a distributor like Konami could of course combine shipping for many different titles in each shipment). Over in Europe, print boxes & shove cartridges in there. So I'd guess plastic (packaging) bits would also have been manufactured in Europe for EU releases. Probably some importer(s) who did the shove-carts-in-retail-boxes part. Technically this could be extended to cartridge shells & labels as well (or even circuit boards), but I doubt any JP company wanted to have *that* manufactured outside JP. Especially since carts were rather expensive & penny-pinching wasn't in fashion those days (at least not for computer-related gear). But what is it with these crazy prices anyway? Just the rarity? Shell out big $$ just to own something that few other people have? Completing one's collection of different versions of a title? Other reasons?